How to choose warm or cool paint colors for a room? That’s a question that I get asked most often and can be quite a challenge depending on your room and the flow of your home. 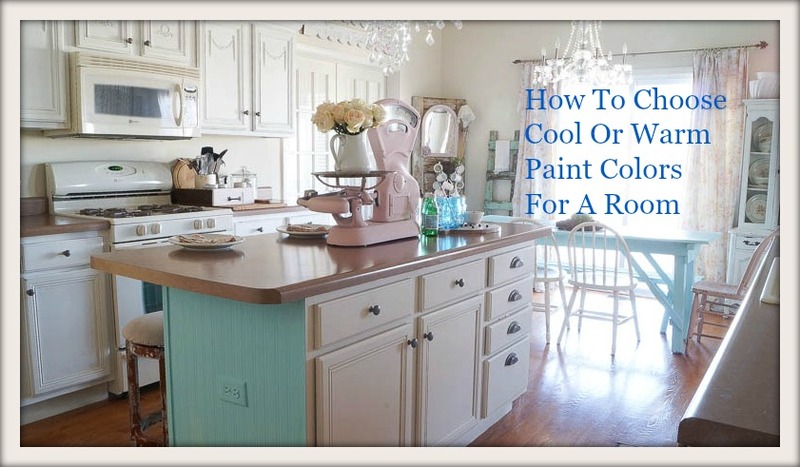 When deciding on how to choose warm or cool paint colors, first think about your style of your furniture, and the colors on your furniture. If you have warmer colors on your furniture than you will want to paint your walls a warmer color and add accent pieces with warmer tones. Keep this in mind if your wood floors or furniture has warmer tones. On the other hand if your like me, and you like to change things up you will want to paint your walls white. But the color white will depend on your floors and furniture. Do you have warm rich wood pieces and floors? If you do than you can paint your walls a warmer tone of white. Now, if you have cooler furniture and floor tones than pick a cooler white color. 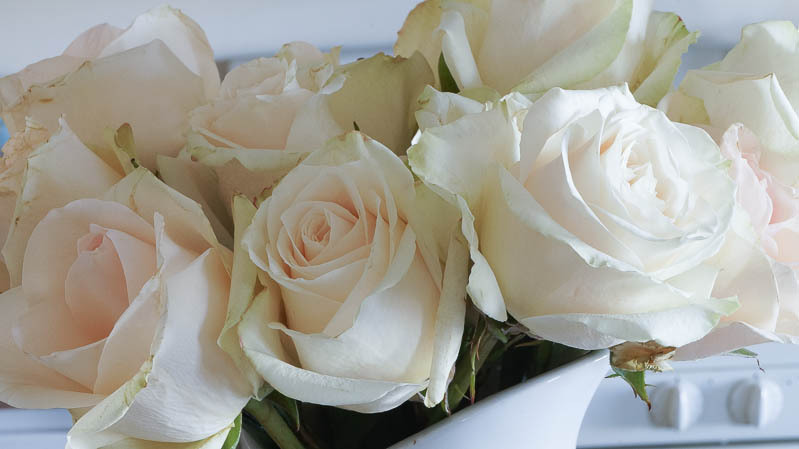 You’ll be surprised at how many different tones of white there are, it’s actually one of the harder colors to choose. One color can look so different at different times of the day and lighting. Let me tell you why I personally love white walls so much. It doesn’t matter what tone white you decide to use on your walls, because it’s a neutral color. Warm or cool tone, you can change out colors at anytime! 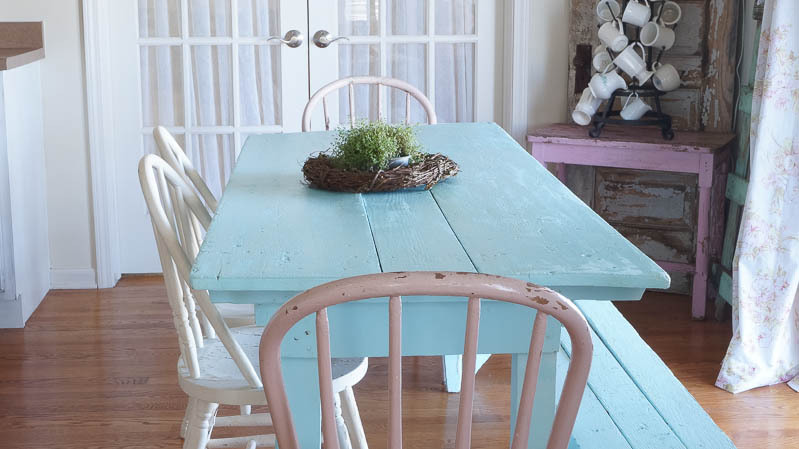 By bringing in a new color on a piece of furniture or accent pieces. 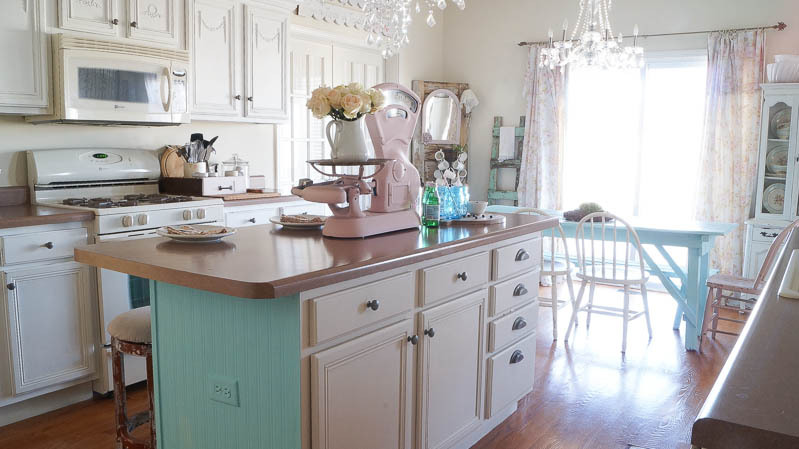 Almost a year ago I added beadboard to my kitchen island, and I also painted it a soft pale pink, which I really loved! 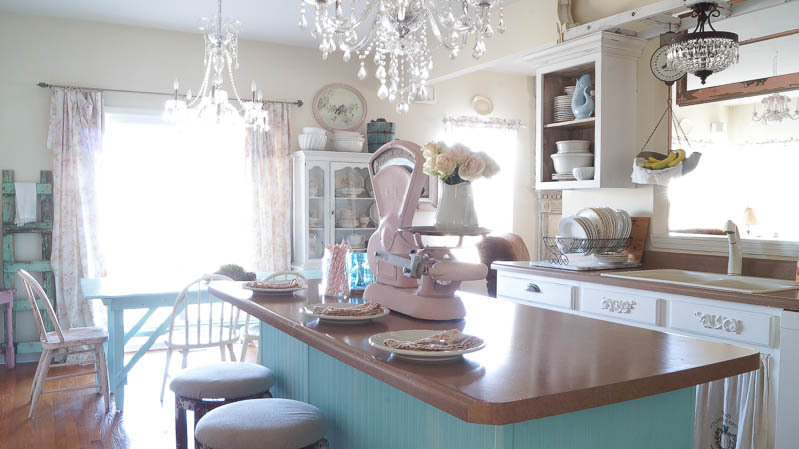 But I have been wanting to give my kitchen a fresh look without spending a lot of money, or making any drastic changes. Mostly because it’s just not in our budget. 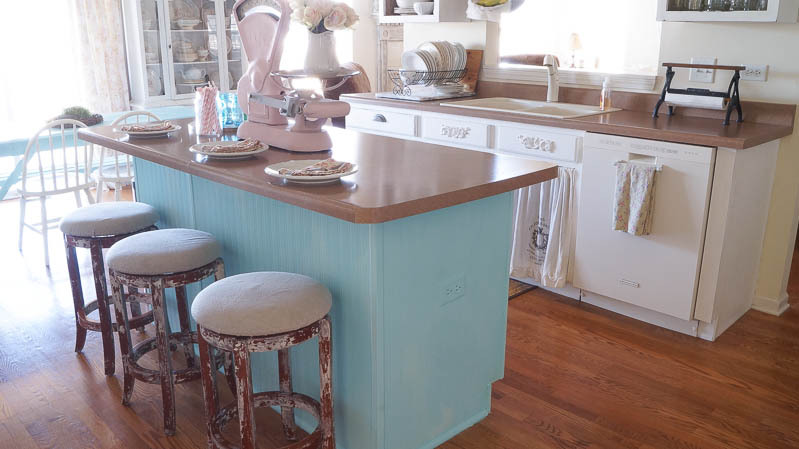 I decided to add a cool color to our kitchen island and my farmhouse table. I love blue ball jars, the color is so pretty! And as you can see, my kitchen hardware has a touch of teal. I faux painted these to look like verdigris, the color of copper as it ages. 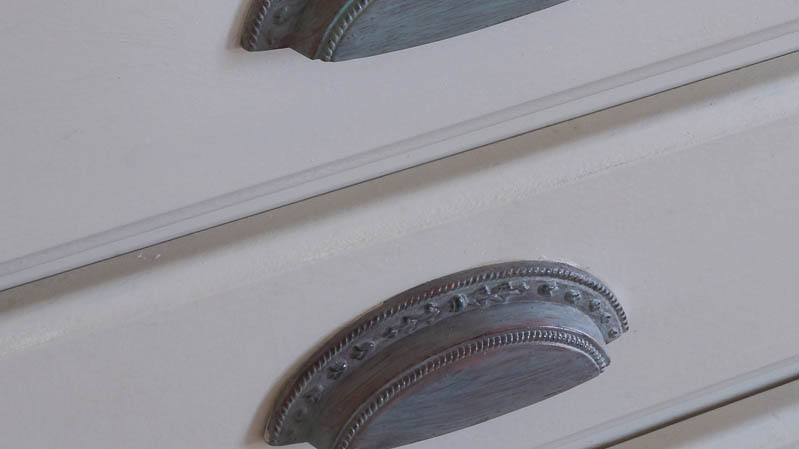 So I took out my paint in Synergy by Heirloom traditions paint, and French Vanilla also from Heirloom traditions. I mixed the two colors until I got just the right tone that I wanted. I was not looking for a bright color, and synergy is a bright, but beautiful color. Adding the French Vanilla softened the tone. 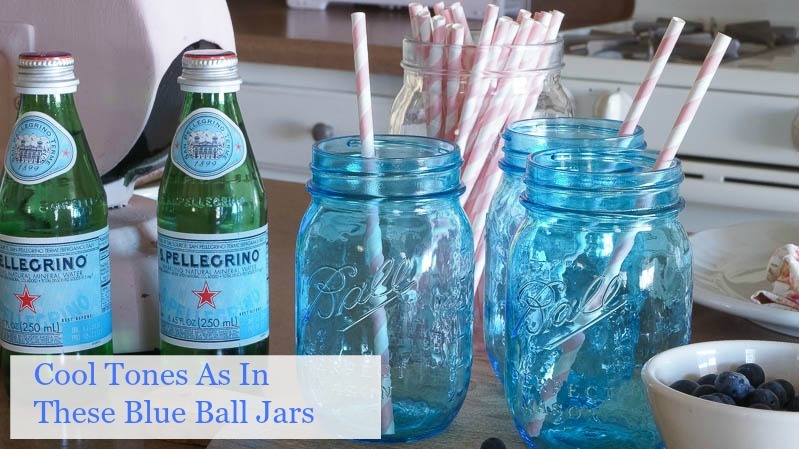 If you love blue ball jars, you will love this color! Yes it’s a cooler color, yes I have warmer wood floors, but this color works beautifully in my kitchen. This color has a warmer tone, even though it’s a cooler color. As my plant on my table, it’s green, but it has a little yellow it it. This beautiful color also adds a pop of color as an accent piece. But I couldn’t stop with my island, I needed to paint my kitchen farmtable as well. I really felt this space needed two pieces in this color. I know it looks like I have a lot of colors going on in here right now, but as you can see they all work together. 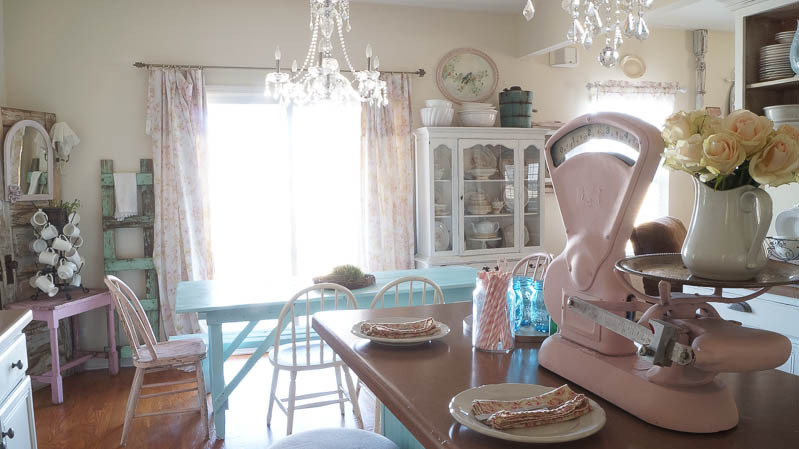 Throughout my kitchen I have turquoise,pink and white. You will see these colors in my furniture, my curtains, my accent pieces and dishes. I actually love the way this color looks next to my black chalkboard wall. My husband asked me if I was going to paint the front of the island, and I said of course not! I like the front white and the other side turquoise. 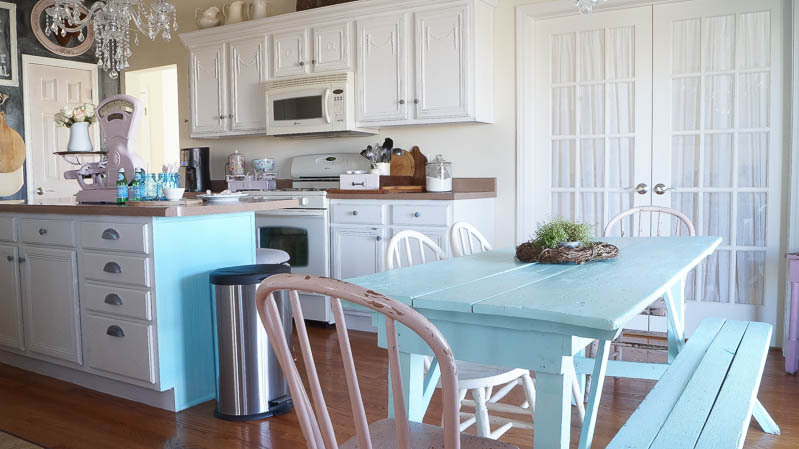 Besides adding a pop of color in my kitchen, I decided to paint my island because of jeans. Yes this post could have been called, it all started with jeans. I was seeing marks on my island from my daughters jeans. I was constantly cleaning my island, so I decided to repaint it. I know that this color is not going to hide the marks and I will have to clean it up as it happens. But I am hoping it won’t drive me crazy every single time it happens. I also decided to use a water based varnish on my island this time instead of wax. I am hoping varnish will be a little more durable than the wax, since this will be marked up often, and I will be cleaning it often too. As they say….live and learn. 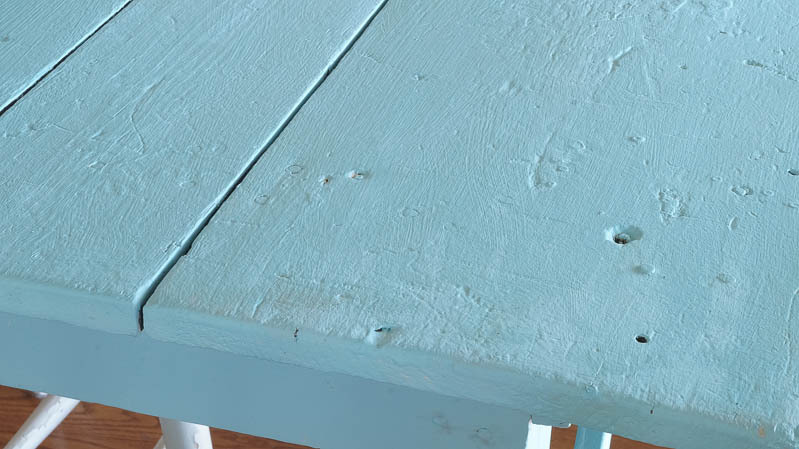 My daughter keeps saying we need to paint our table aqua and I have reststed. But this softer one is a definite maybe! She’ll be happy! Love this so much Anne! Shared it on my blog today! I adore your soft style! 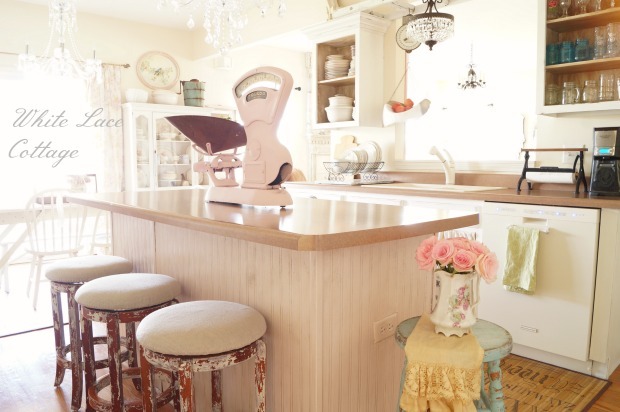 Everything is so light and pretty and your natural light in that space is just dreamy! Your home is gorgeous! Thanks for the wonderful tips Anne. Love your kitchen BTW! Who would have thought it would make so much color but, it does and it works. Anne,i really like your kitchen. Oh, I like the new pop of color. I love your kitchen-the colors look very pretty together. I love the pink and blue together. 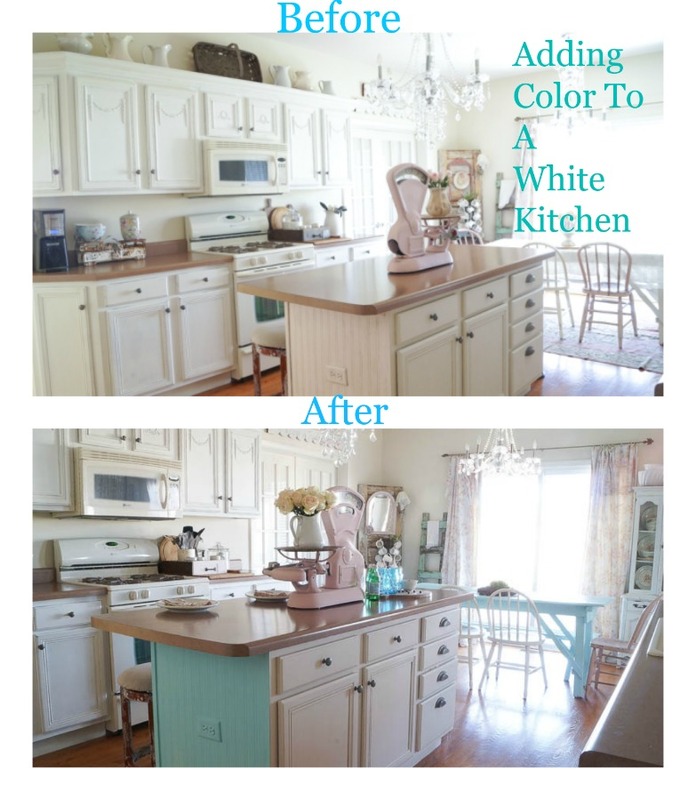 Love your kitchen but the article on choosing colors was very helpful! What if you have white furniture? Stymied! Ha!